Edited by Marvin D. Atkins and Ruth L. Bush . The first successful open surgical repair of an abdominal aortic aneurysm was in 1951 by Dubost and represented a tremendous milestone in the care of this challenging disease. The introduction of endovascular repair in 1991 by Parodi furthered the care of these patients by allowing for lower morbidity and mortality rates and also, enabling surgeons to extend surgical treatment to patients traditionally deemed too high of a surgical risk. This new book on Aortic Disease covers many interesting and vital topics necessary for both the practicing surgeon as well as a student of vascular disease. The book starts with background information on the evolution of aortic management from traditional open surgical repair to modern endovascular therapies. There is also a chapter covering the data supporting current treatment modalities and how these data have supported modern management. Also, the use of endovascular means for care of the challenging situation of ruptured aneurysms is discussed. 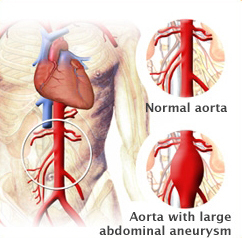 In addition to management of abdominal aneurysm, there is a chapter on treatment of aneurysms of the ascending aorta. Along with surgical treatment, one must also understand the molecular basis for how blood vessels remodel and thus, the role of cathepsins in aortic disease is elucidated. Lastly, chapters discussing the perioperative management of radiation exposure and ultrasound-guided nerve blocks as well as the need for high-quality postoperative nutrition will lend well to a full understanding of how to management patients from presentation to hospital discharge. We hope you enjoy this book, its variety of topics, and gain a fuller knowledge of Aneurysmal Disease of the Thoracic and Abdominal Aorta. Ruth L. Bush, M.D., M.P.H.